I kind of hate my sewing machine, and yet, there are times when I just can’t stay away. For example, I might find myself spending a long Sunday sewing two small-sized pirate shirts instead of skiing like everyone else I know. I might find myself puzzling over how to fit the sleeve into the shoulder with just the right amount of puffiness, or how to cinch the cuff so my 5 year old can easily get it on and off. 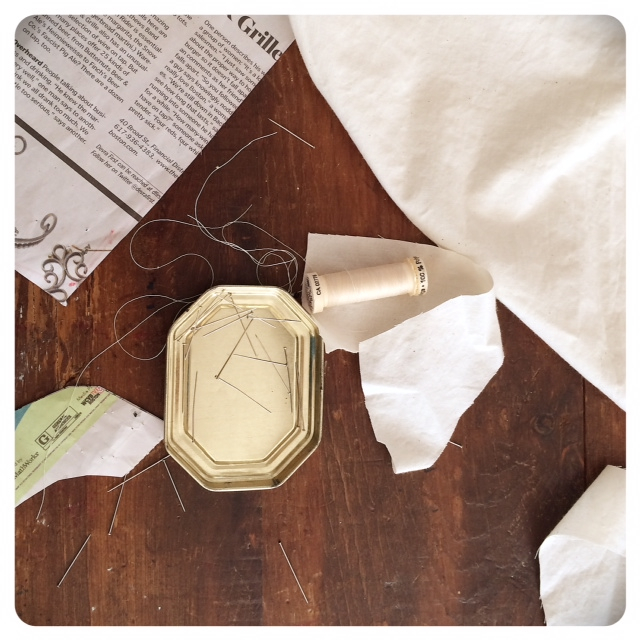 I might find myself looking at a kitchen table covered in scraps of unbleached muslin, newspaper patterns, bits of thread and straight pins, and wonder what was I thinking?? Why did I take this project on?? My mother once said that knowing how to sew can feel like a curse. When you know how to sew you see how simple and easy it can be to make something. You can imagine customizing and creating exactly what you want – color, fit, feel, functionality. You can imagine and execute any number of stunning and special projects. 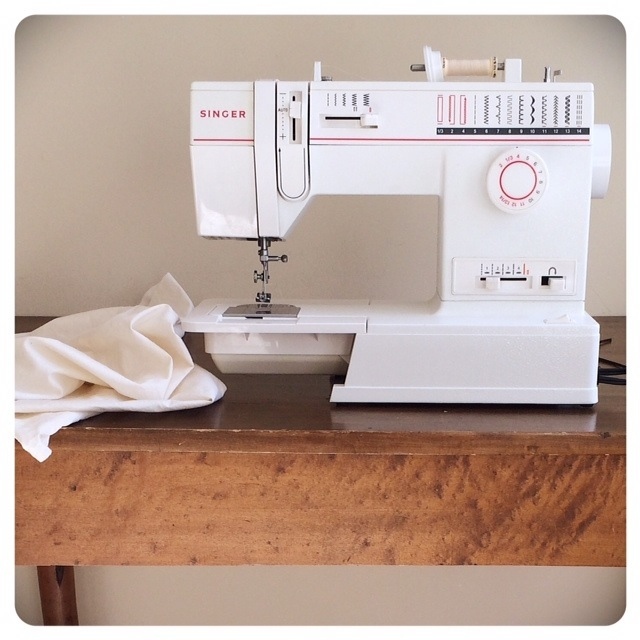 Sounds like a blessing (and it is) but sewing projects take time. Lots of time. I could never possibly do all I dream up so I have to pick and choose which projects are worth it. Yes, there are probably mothers out there who manage to hand sew all their children’s clothing while also homeschooling, eschewing refined sugars, and building a home composter. But I’m over any form of competitive mothering. I’ve settled for polyester superhero suits with stitched in muscles and dubious plastic party favors. But simply knowing the hand-made possibilities makes this settling hard to do. In my household, costume collaborations always start strong, but by the end of the project, my children have run off to play legos while I finish up. I’m fine with that – we’re not raising them to be tailors. But I sometimes wonder – wouldn’t it have been easier to just buy a flimsy scrap of polyester? I remind myself: its the process, not the product. I know there are benefits of doing these types of projects with my children. We work together, they exercise a few skills (pinning, cutting, sewing) and they learn something about sequencing a project (draw pattern, cut newspaper, pin it to fabric, cut fabric, etc.). Its a creative collaboration that allows my children to see and experience something more authentic and less made-in-china. 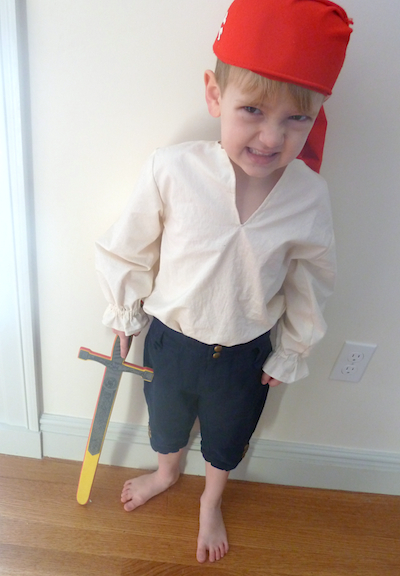 As I clean up and muse about the value of sewing projects, a wee pirate bounds into the room, smiling and proud, brandishing his pirate sword and smoothing his fresh pirate shirt over knee breeches. Yes, our afternoon of sewing has been a success, though, next time, I might consider a less time consuming cooking project. P.S. 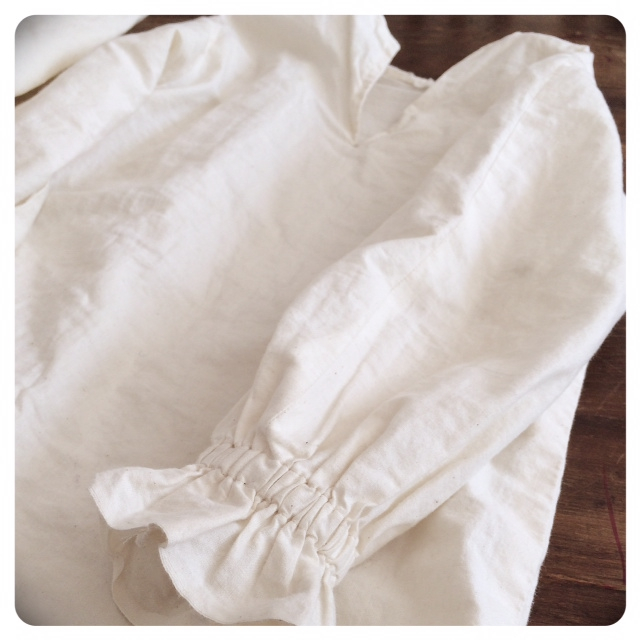 I sat down to write a post about how to make a pirate shirt and wrote this instead. Clearly, I needed to work through my feelings about the value of sewing children’s costumes. In my next post, I’ll share some DIY instructions and what I learned about how to actually make one of these. EDITED 2/27/14: I’ve now posted some directions here. 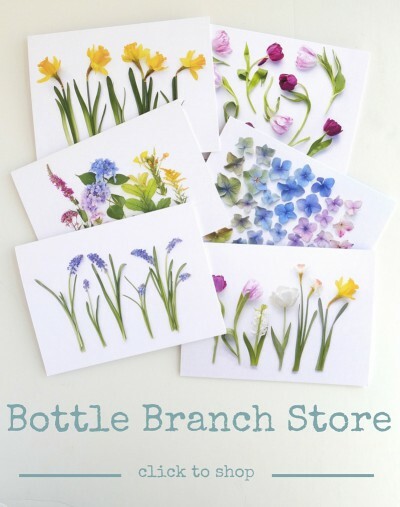 If I haven’t scared you off and you want to make one of these, hope my tutorial can help! Love this… the mixed emotions of a time-consuming project, and the adorable outcome. Your writing is warm banana bread. I want more! Gosh, I’m blushing! Thanks, Britt! This took me back to the years of making costumes for my boys… and yes it was a curse as well as a blessing. But I don’t regret any one of them when I remember the joy they brought. Your little pirate looks fabulous! Thanks, Gina. He’s my littlest pirate, so I know I have to really enjoy the last few years of having a “little” kid around (but don’t tell him he’s little!) … I hope I won’t regret the sewing either!